Simple is the key some nights…who am I kidding, most nights! 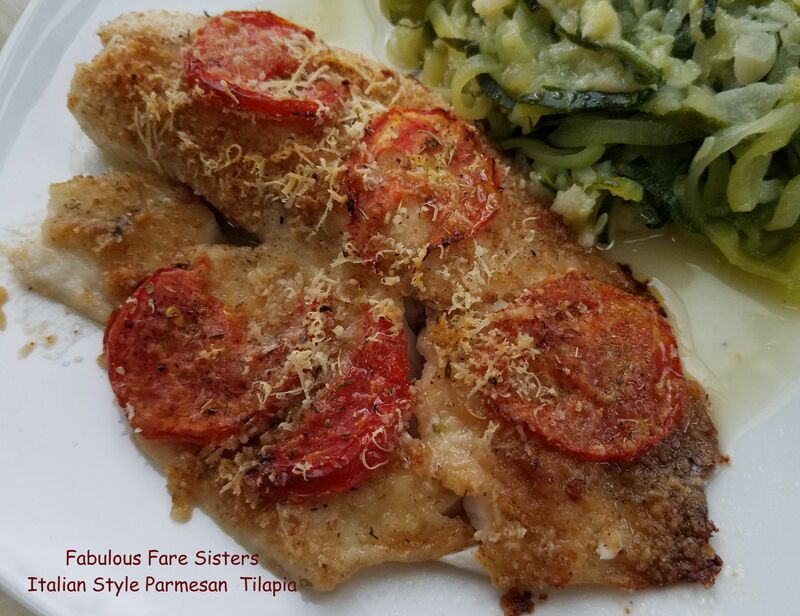 Anyway, today I made a simple Italian style Parmesan (Pecorino Romano) Tilapia. This fish does not have a lot of flavor on its own, so it was the perfect fish to use for this flavorful dish. I served it with spaghetti zucchini and a little garlic butter. Heat the oven to 425°F. Melt the butter in the oven in a cast iron skillet. Mix the bread crumbs, onion powder, garlic powder, oregano, basil, salt & pepper, and half the cheese together in a shallow dish. When the butter is melted, dredge the fish in the butter then coat with the bread mixture. Place the fish in the pan and cover with sliced tomatoes, the rest of the cheese and the drizzle of olive oil. Bake until done, about 12 minutes. Serve with a side of your favorite veggie. Delicious! Nice presentation! I’ve been wanting to try another fish lately. We’ve been eating a lot of Salmon and Shrimp. I’ve been craving a white fish. Spaghetti Zucchini? Do you Spiralize it? I do! I also love that you can buy it that way in the grocery store now. Time saver!!! Lovely and healthy Heidi and although you class it as simple I’d be happy paying good money for this in a restaurant! Awww… Thanks! You’re so sweet!!! Delicious and my favorite… easy!